to suggest alternate routes. When Google engineers began to tackle the problem of automatic translation online, they relied on translation data from hundreds of thousands of websites in many languages. Similarly, as we’re in the process of bringing Google Fiber to Kansas City, KS and Kansas City, MO, we need to first understand how many people here already have access to broadband, and more importantly, how many don’t. In order to get a grasp on the situation we partnered with a group that’s full of community experts—the Mayor’s Bistate Innovation Team (MBIT)—to commission a study on broadband adoption and digital literacy in Kansas City. Today, we’re gathering with MBIT at the Kansas City, MO Central Library to release and discuss the data that we’ve collected. The good news is that a lot Kansas Citians seem to recognize the value of the web. Those surveyed said that the Internet can be helpful when it comes to job hunting, getting health information, and learning new things. Unfortunately, our study also illustrates that there is a real digital divide in both Kansas Cities. We found that 17% of Kansas Citians are not going online at all, and 8% are only using dial-up or slow speed wireless connections. 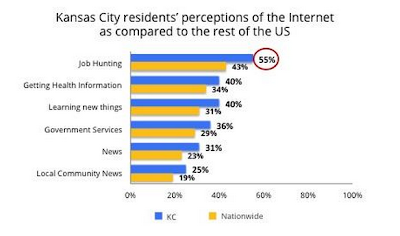 These stats lead to a follow-up question: why are one-quarter of Kansas Citians not connected to the web at home? We found that one of the primary reasons is cost. 28% of those who don’t use said that they don’t go online because they don’t have a computer, or because Internet access is too expensive. Meanwhile, 41% of respondents said they don’t go online because they just don’t think it’s relevant to their lives. This is a big deal. Using the Internet isn’t just about checking email and social networking. Access to broadband—and knowing how to use it—has become essential when it comes to jobs, education, business and much more. The web provides a wealth of information and services for Internet users, and people who aren’t online are, simply put, at a huge disadvantage. A job search, for example, is much harder today without the ability to review job listings and apply online. Similarly, computer skills and digital literacy have become perquisites for the majority of job opportunities. From a policy standpoint, we can try and address these issues by encouraging policies that will make computers and Internet access more affordable, and promote digital literacy initiatives. But a lot of outreach and education needs to take place on a community level. And that’s why this morning we’ve joined representatives from amazing local nonprofits, schools, libraries, city governments and other community experts in a discussion about how to take action and get Kansas Citians online using broadband Internet access. We’ll post the video of our discussion here as soon as it’s ready. In the meantime, you can peruse or download the full results of our study. The Google Fiber project is about making the web better and faster—but it’s also about making the Internet more accessible for people throughout Kansas City. Digital inclusion here is a priority for Google, and it’s clear that it’s also a priority for community nonprofits and the local governments. Update: We're also sharing our research on a neighborhood-by-neighborhood level. You can read or download the findings if you're interested! Google is all about building data-driven products. When users of Google Navigation wanted the ability to circumnavigate heavy traffic, we began to use real-time traffic data to suggest alternate routes. When Google engineers began to tackle the problem of automatic translation online, they relied on translation data from hundreds of thousands of websites in many languages.